Prominent & Leading Manufacturer from Chennai, we offer deionization system and uv disinfection system. 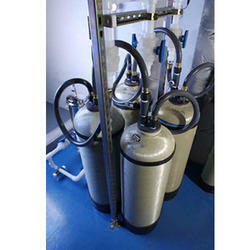 We are engaged in manufacturing and exporting a superior quality range of Deionization System. These Deionization Systems are used for producing high purity water for engineering, semi conductor and pharmaceutical companies.Our product range consists of pretreatment system followed by R.O and EDI (Elector deionization system) and produces purified water having resistivity up to 18.2 MΩ/cm. 8. Back washable 9. Repeatedly steam steriliser 10. FDA approved materials 11. Range of micron rating from 10m to .001m 12. Integrity testable by bubble point or diffusion flow test. 13. Special designed for mineral water processing systems. Our esteemed clients can avail a wide range of Water Treatment Equipments including UV Disinfection System that is extensively used in different industrial sectors such as food and beverage, pharmaceutical, hotel, and so forth. These are highly cost effective due to low operating costs. These are appreciated because there is no change in pH, taste and odor of water and the process is completely free from use of chemicals. These are manufactured by using the best grades of metal alloys and other components for durability.